Ten year old Zachary declared this medieval horn spoon his favourite object during a workshop. He said: “The thought of a spoon made from horn surviving so long is extraordinary”. I couldn’t agree more. The spoon is also very special because it allows us a glimpse into ordinary people’s lives. Horn, bone and antler were the plastic of medieval Ireland – cheap and easy to use. Horn from cows, oxen, sheep and goats were cut into shape and polished using wet, soft leather and damp sand – the medieval equivalent to modern sandpaper. It was then made flexible by soaking, heating or boiling it in animal fat. A wooden mould was used to press the horn pieces into the shape of a spoon. 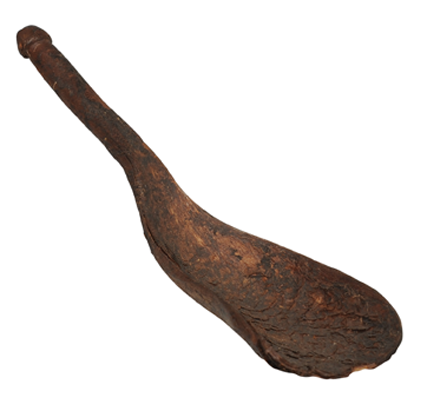 This spoon is currently on loan to Kerry County Museum from the National Museum of Ireland.